Cissus Quadrangularis has been used in traditional Ayurvedic system for weight management, to heal broken bones and injured ligaments and tendons. 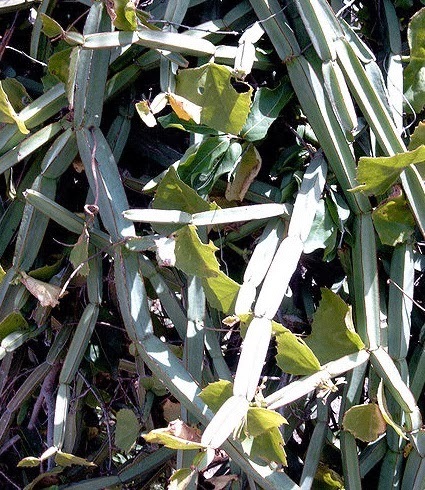 Cissus quadrangularis reaches a height of 1.5 m. Its mostly seen in dry waste lands. It is said to have antibacterial, antifungal, antioxidant , anthelmintic, antihemorrhoidal and analgesic activities. Its bactericidal effects treatment of gastric ulcers. A weight loss supplement containing Cissus quadrangularis and other ingredients including green tea, soya, selenium, chromium, and B vitamins was evaluated in an 8-week trial. The supplement helped reduce significant weight loss. Cissus quadrangularis revealed faster initiation of healing process. A study was undertaken to evaluate the effect of methanolic extract of Cissus quadrangularis on the healing process on dog. Cissus quadrangularis treated animals revealed faster initiation of healing process. Cissus quadrangularis is used for obesity, diabetes, high cholesterol and stomach upset. Diabetes, High cholesterol, Bone fractures, Upset stomach, Stomach ulcers, Asthma, Malaria, Pain, Bodybuilding. Flesh from the stem after removing the skin is mixed with Coriander, Pepper, Ginger, Mint leaves, Tamarind, carry leaves, proper quantity of Dhall and fried in oil to make edible curry will be good for health.